Hand knitters salivate over the rich colors and tonal shifts of hand-dyed yarns. “Hand dyes turn even simple stitches into something special,” says Alexandra Parks, founder of Dashing Mouse Designs. After dropping out of grad school, Parks, a lifelong knitter, took a job at Silk Road Textiles in College Hill. 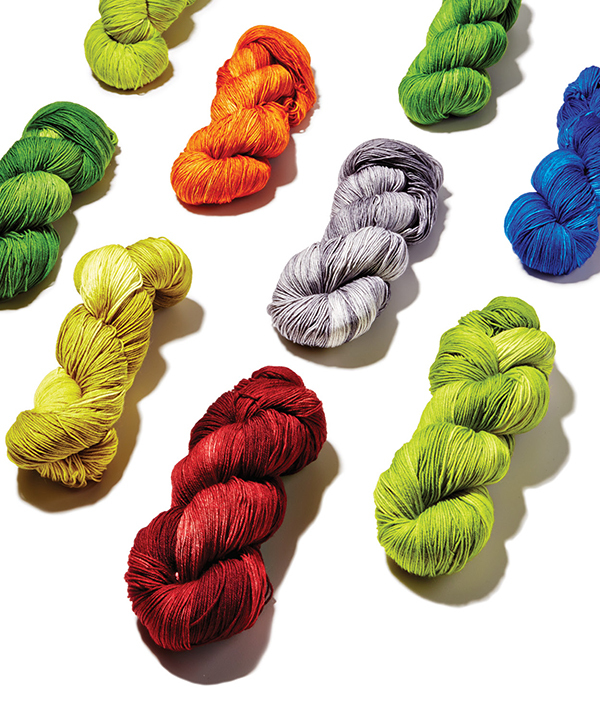 “I thought it would be cool to have some hand-dyed yarn in the store to set us apart. The worst that could happen would be having a huge stash of hand-dyed yarn for myself,” she says. But the best thing happened: Dashing Mouse has become the best selling sock yarn in the store. “I’m a peacock. I like greens, blues, purples, and I’m on a quest to create the perfect burnt umber,” Parks says. Her husband wanted hand-knit socks in more muted shades like gray and brown, which have turned out to be some of her best sellers. Find her yarns at Silk Road Textiles or on her website, dashingmousedesigns.com (with needles, bags, and patterns). Dashing Mouse’s sock yarn base is 75 percent superwash wool blended with 25 percent nylon for durability. Parks favors highly spun yarn with a tight twist. “The less chance the fibers have to abrade against each other the more durable your socks are,” she says. On a typical day, Parks custom-blends her signature colors using powdered acid dyes and tints around 100 skeins in batches of six atop her kitchen stove. No easy feat considering the water temperature must remain constant at just below boiling.